I have some rather exciting news to share with you all this morning! I am really excited to announce that I am a sparkly brand new Design Team member of the Indigoblu Challenge Blog!! I am really looking forward to work along with the other girls on the team and to be able to work with the fabulous Indigoblu products, and produce samples for the challenges each month! 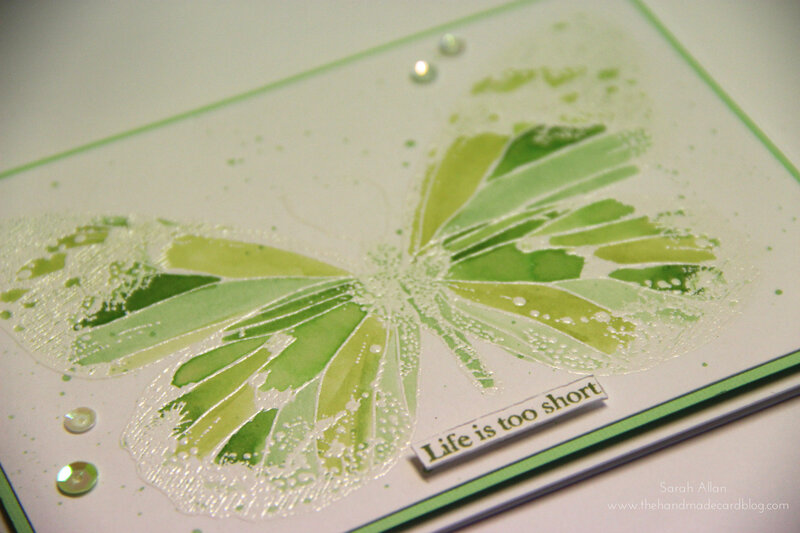 The theme this month is Monochromatic and I chose a clean and simple card design using various hues of green.. incorporating a couple of “on trend” styles including watercolouring and sequins and links to the Indigoblu products will be listed at the bottom of this post. 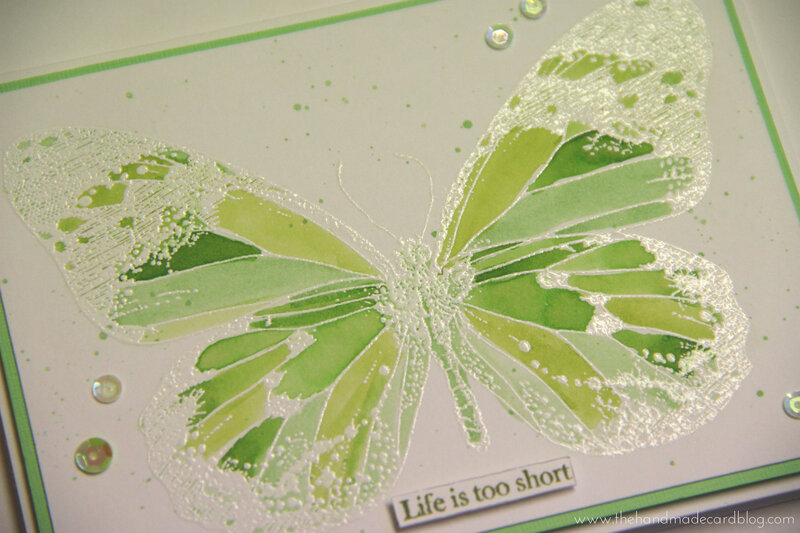 I used the Big Butterfly Stamp, which I absolutely LOVE!, inked up with versamark, embossed with ultra fine white embossing powder, then watercoloured with various different hues of green water based inks, the card panel has scattered ink spots and a sprinkling of sequins to finish it off. As always, thanks so much for popping round. Congratulations Sarah! That is fantastic news!! So very well deserved! I look forward to seeing your amazing creations and checking out the challenge too. They look like they have gorgeous products. 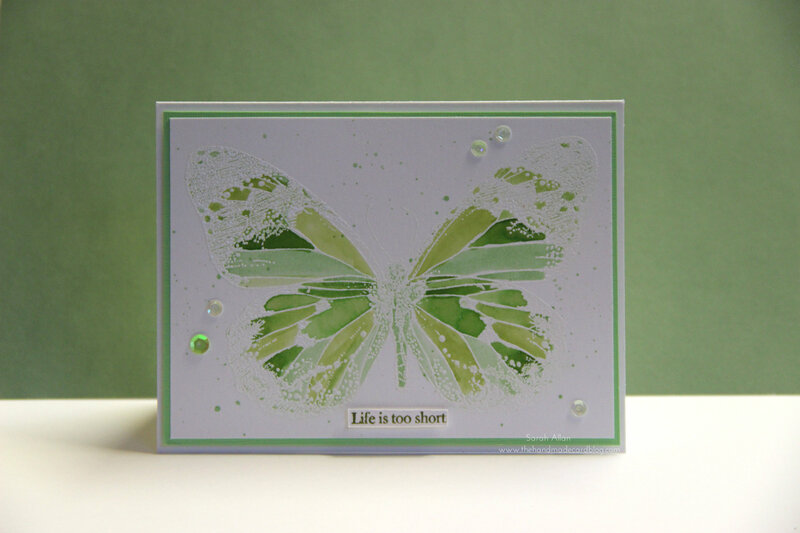 BTW – totally lovely butterfly card too. Those green hues are so tranquil. Such a pretty card., and congrats!